garden waste recycling programs | What's Green with Betsy?!? There is nothing more beautiful than fall foliage, but what do you do with the fallen leaves? According to the EPA, yard waste is the second-largest component of our trash stream (behind paper and corrugated boxes) and makes up roughly 20 percent of most communities’ haul. Additionally, trucking the bulky bags to the dump requires a lot of fuel. Americans can be obsessive about fallen leaves on the lawn. Below are some eco-friendly approaches to dealing with them. Dead leaves are actually Mother Nature’s food, rich in minerals, falling right where they are needed. With a good mulching mower you can leave a large number of leaves on the lawn to add nutrition, but don’t leave so much that they smother the lawn and cause snow mold. Fallen leaves can be composted into nutrient-rich soil for your spring garden. The leaves of one large shade tree can be worth as much as $50 of plant food and humus, according to CompostGuide.com. Leaves are a great soil conditioner and can also be added to your perennial beds for nutrients and as protective mulch. If you prefer to get rid of them, check and see if your community has garden waste recycling programs, or offer them to neighbors, garden clubs or local farmers for composting. Most town transfer stations take leaves for composting too. 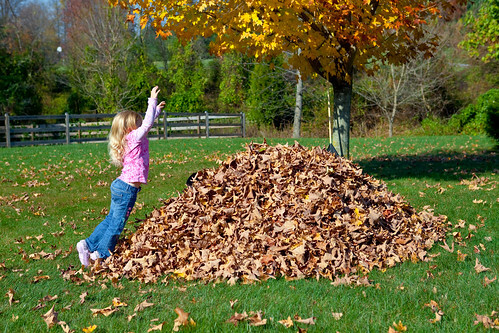 When gathering your leaves, rakes are more effective, cheaper and certainly “greener” than a leaf blower! And – raking is great exercise! When using a leaf blower, try a quiet, energy-efficient electric one. If you do bag your leaves, use biodegradable ones. Green Genius makes bags that are the same strength and price of regular trash bags, but biodegrade within 1 to 15 years. You can purchase them at Whole Foods or Hannafords. Fallen leaves are part of nature’s perfect system, so please don’t interfere and throw them away. One of my readers commented that she uses barrels for her raked leaves that then get emptied into the recycle trucks which comes every week for six weeks. No bags at all! That’s the way to go if you don’t want to use the leaves. I love the idea of recycle trucks for leaves – towns have come a long way!